Get the most out of Aurora for everything you do! Aurora provides fast and secure web-based analysis of interference conditions between satellite networks. And now with Wavefront’s new Add-Ons, you can do even more. Explore Aurora Add-Ons and discover the power they add for you. You can automatically screen the biweekly IFICs for new systems. Aurora’s Monitoring Add-On lets you define the monitoring criteria. You receive alerts to any new satellite systems that would impact you. Save time and gain insight with Aurora’s Monitoring Add-On. You can easily compute and display numerically the interference condition between a pair of emissions. Plus, you can do this at any number of locations you select from a global list, dynamically determining the link availability. This Aurora Add-On provides comprehensive details to complement an emission analysis. Upload custom satellite system filing data. With Aurora’s Custom Files, you can use Microsoft Access (.MDB) files and custom space station antenna gain contours in GIMS (.GXT) files. You can examine systems characteristics that are not reflected in the SRS or GIMS databases. You gain flexibility by utilizing user generated filing data or unpublished data generated during coordination activities. Using a graphical form, this Add-On computes and visually displays the interference condition between a pair of emissions. With Aurora’s Grid Analysis Add-On you can choose between contour or color plots to visualize interference conditions anywhere in the world. 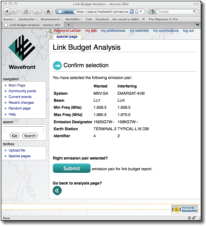 With this Add-On you can quickly display numerically the interference condition between a pair of emissions at a single location. With Aurora’s Link Budget Add-On you can quickly determine contributing factors to the interference condition, making you more effective in coordination activities.